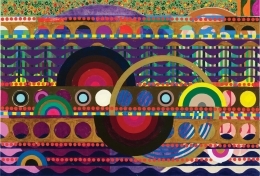 James Cohan is pleased to present Marola, the gallery’s fifth solo exhibition by Brazilian artist, Beatriz Milhazes, on view from October 22 through November 28, 2015. A reception for the artist will take place on Thursday, October 22, from 6 – 8 PM. This exhibition of nine new paintings and two sculptures comes just after her critically acclaimed US retrospective Jardim Botânico at the Perez Art Museum, Miami (PAMM) this past winter. The exhibition title, Marola, refers to the ripples that follow after a large wave; the reverberating rhythms of water. This is one of the many visual metaphors being referenced in this new series of paintings, as well as a title of one of the sculptures. Milhazes has also had an ongoing dialogue with Henri Matisse’s cut-outs, Sonia Delaunay’s chromatic geometries, Bridget Riley’s optical compositions, and the vertical totems and paintings of the Brazilian artist Ione Saldanha. The culture of Brazil is always deeply embedded in Milhazes’ work: the 17th century Baroque colonial architecture of Rio de Janeiro, the lush tropical vegetation, the mid-century garden designs of Roberto Burle Marx, and the pulsing energy of Carnival. Through a unique process she has developed called “mono-transfer”, Milhazes applies hand-painted decals directly to the canvas that are sourced from her vast vocabulary of shapes and motifs – among them arabesques, pinwheels and radiating targets. Through the layering of abstract forms and her renowned use of color, Milhazes creates compositions which are evocative of a multi-part musical score, where the sounds of each different instrument collide and coalesce with one another into a single harmonious whole. The two hanging sculptures on view represent an important new development for Milhazes. They have evolved from a set design she created for her sister's modern dance company in 2006, followed by a series of related works entitled Gamboa, which were made in Rio by craftsmen who make the floats for Carnival. These new sculptures were made at Durham Press in Durham, Pa. with materials as diverse as painted wood balls, beaded curtains, colored Plexiglas, silk flowers and mirrored steel. The sculptures employ strategies reminiscent of her paintings such as rhyming forms and layered surfaces which reveal and conceal underlying patterns, bringing her acclaimed vernacular of color and movement into three dimensions. 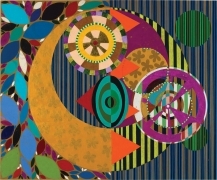 Beatriz Milhazes (born 1960 in Rio de Janeiro, Brazil) has been exhibiting her work internationally for nearly three decades. The artist represented Brazil at the 2003 Biennale di Venezia and has participated in important group exhibitions including the Carnegie International (1995); International Biennial of Sao Paolo (1998 and 2005); Biennale of Sydney, Australia (2008); Shanghai Biennial (2006); and Prospect I, New Orleans (2008). Selected solo exhibitions include: 2014, Jardim Botanico, Perez Art Museum Miami; 2013, Meu Bem, Paco Imperiale, Rio de Janeiro, Brazil; 2012 Panamericano, MALBA-Fundacion Costantini, Buenos Aires, Argentina; 2011, Beatriz Milhazes, Fondation Beyeler, Basel, Switzerland travelled to Calouste Gulbenkian Foundation, Lisbon, Portugal; 2009, Beatriz Milhazes, Fondation Cartier, Paris, France; 2008, Beatriz Milhazes - Pinturas e Colagens, Pinacoteca do Estação, Sao Paolo. Milhazes’ work is included in prestigious international collections including the Solomon R. Guggenheim Museum, the Metropolitan Museum of Art and the Museum of Modern Art, New York, NY; the Carnegie Museum of Art, Pittsburgh, PA; San Francisco Museum of Modern Art, San Francisco, CA; Museo Nacional Centro de Arte Reina Sofia, Madrid, Spain; 21st Century Museum of Contemporary Art, Kanazawa, Japan to name a few. 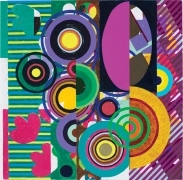 Beatriz Milhazes lives and works in Rio de Janeiro, Brazil. For other inquiries, please contact Jessica Lin Cox at jcox@jamescohan.com or at 212-714-9500.